Low, fast moving clouds blocking a setting sun gave this Brooklyn Bridge sunset a dramatic feel. I probably needed to bracket this shot, but out of fear of missing the light, I decided not to run to my car to grab my tripod. I was right! In a matter of minutes the light changed and became less dramatic. 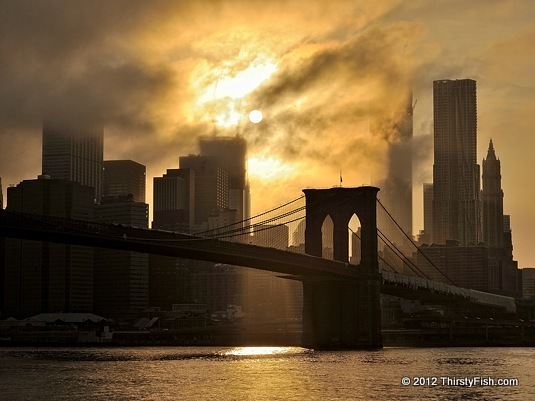 The building you see fading into the clouds, just on the right of Brooklyn Bridge is the not yet completed 1 WTC. You can see how much progress has been made by comparing it to a photo taken exactly one year ago. Prime Lenses are lenses whose focal length is fixed, as opposed to zoom lenses where the focal length can be varied. When I go for my short photo walks, I usually take a single prime lens (24mm, 35mm or 85mm full frame equivalent). Although they say that you must let your feet do the zooming, this is always not possible. One can not always walk on water. Prime lenses force you to move in and out, right and left, up and down, until you find a meaningful way to compose the shot. For travel, I usually carry two lenses; a wide (24mm or 35mm) and a short telephoto (85mm). If you pay attention to your composition, these two lenses should be all you need for most urban and people shots.